Cats are everywhere – in rural areas and cities, behind and alongside buildings, on rooftops, in trees, under cars, in hospitals, and even perched on air conditioning units on the sides of buildings. Israel's Veterinary Services has no estimate of their numbers, other than to say there are many thousands. In the U.S., the number of feral cats is estimated by Dr. Andrew Rowan, former Director of Tufts University's Center for Animals and Public Policy, at 30 to 40 million. In Israeli cities, cats can be seen soliciting scraps in outdoor cafes, and roaming the streets at night, combing through open refuse containers in search of a discarded crust of bread or anything to stave off hunger for one more day. The country's warm climate and inadequate garbage collection services enable many to live on the edge of survival long enough to reproduce, in a never ending, short cycle of birth, suffering, and painful death. Feral cats are the offspring of tame cats whose owners failed to spay or neuter them and who abandoned them. These cats reproduced and their kittens never had contact with humans. Feral cats can be elusive, do not easily trust humans, and can be difficult to capture. Although they fear humans, they are still domestic animals and, unlike wild animals, cannot fend for themselves. While cared-for companion animals can live more than 17 years, studies in the U.S. have shown that feral cats without responsible caregivers live an average of 2 to 5 years. What is their fate on the streets, without intervention? Feral cats do not die of old age. Without responsible guardians who provide them with food, water, shelter, and medical care when they are sick or injured, they can die slowly and painfully from a variety of causes. A scratch from a fight with another cat or a cut from the jagged lid of a can in the garbage bin can become an abscess. Urinary tract infections in males cause blockages that lead to extremely painful, lingering deaths, if left untreated. The herpes virus, if not treated with antibiotics, can cause blindness, and is contagious to other cats. Cats blind in one or both eyes are not uncommon on the streets of Israel. Cats also die from dehydration in summer, when temperatures can soar to over 38 degrees Celsius (100 degrees Fahrenheit) and there is no rain for months at a time. Lack of adequate nutrition weakens their teeth, making it difficult to eat. Being hit by a car can result in broken bones or internal injuries. Other animals or cruel people can also inflict fatal wounds. Diseases such as rabies, feline immunodeficiency virus (FIV), feline leukemia (FeLV), and feline infectious peritonitis (FIP) are fatal. These diseases are contagious to other cats, but not to people. An upper respiratory infection caused by an immune system weakened by FIV or other disease can make seeing or breathing difficult, and especially in winter, cats on the streets of Israel can be seen struggling to take a breath. A "natural" death is neither quick nor painless. Cats, like all animals, including humans, need regular care. Feral cat population control is an emotional issue and the topic of heated debate. Municipal officials are concerned that large numbers of unvaccinated, unhealthy animals in the streets will endanger human health. They and some animal organizations and animal shelters in the U.S. and abroad take the stand that leaving cats to fend for themselves is inhumane. Because of all the terrible things that inevitably happen to cats on the street, they believe trapping and euthanizing, especially those without responsible caregivers, is the most humane and responsible option. Other animal organizations and shelters believe trapping and euthanizing is not a humane solution and that non-lethal methods of animal control should be found. Wildlife organizations complain that cats kill large numbers of birds, small mammals, and other wildlife. One study by Tel Aviv University showed that feral cats are not a threat to wildlife within cities, though birds, rodents, and lizards do make up their diet outside of cities. The American Bird Conservancy estimates that free-roaming cats, including the millions of cats with homes whose guardians allow them to go outside, kill millions of birds and small mammals in the U.S. every year, including endangered species. Other studies show that while cats do kill wildlife, loss of habitat does significantly more damage overall than cats. Most animal shelters do not have facilities to be able to properly house feral cats, test them for contagious diseases, and socialize them so they have a chance of finding a home. Typically, U.S. shelters keep cats who came from the street, rather than from a home, for a week-long holding period to allow their guardians to claim them, if they have guardians, or to give them time to calm down so an assessment can be made as to whether they are tame enough to be put up for adoption. Feral cats are among the up to 6 million animals euthanized in U.S. shelters every year. 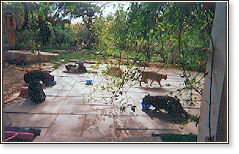 Some groups spay or neuter and release feral cats. Altering is beneficial to the individual cat for many reasons (see Spaying Your Cat and Neutering Your Cat). However, altering alone will not prevent cats from suffering. Cats need a stable environment. Buildings that cats occupy can be torn down, residents who feed cats without having backup caregivers may move away or lose interest. 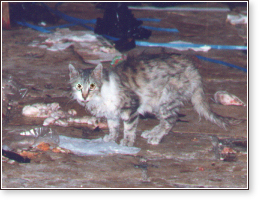 All responsible humane organizations agree that it is not humane to trap cats in one location and release them into another without making substantial and sustained efforts to acclimate them to the new area, which includes keeping them in cages or other enclosures for a lengthy period before releasing them, and continuing to feed them after release. Unfamiliar with food sources and hiding places in new locations, unable to defend a territory from resident cats, without a lengthy period of acclimating them, they will be driven off and will not survive long. 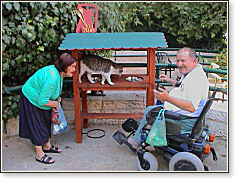 Following a pilot project conducted by Israel's Ministry of the Environment in 2005, several municipalities in Israel have provided all or part of the funding for trap/neuter/vaccinate/release (TNR) programs for feral cats. In 2007, government officials proposed a law that will provide such funding throughout the country. The term "managed colony," when used correctly, refers to a group of feral cats who are under the supervision of people who adhere to strict standards of care. Done responsibly, managing a feral cat program requires a substantial commitment of time and energy. Cats are trapped, neutered or spayed, identified as altered (usually with eartipping, removing the tip of one ear while still under anesthesia), and vaccinated against rabies and other diseases. They are released only where the climate is not harsh or where there is adequate shelter from harsh weather, and where it is reasonable to expect that they will be safe from traffic, other animals, and cruel people. Regular food and water is provided daily, in sanitary conditions, by caregivers who ensure that support is provided even on holidays, weekends, or when one caregiver becomes sick or moves away. The cats are provided with ongoing medical care, as necessary. Kittens are removed and adopted out, old or sick cats with a poor quality of life are euthanized to prevent their suffering, and all new cats entering the area are immediately altered. Adequate recordkeeping is maintained for all the cats. Does trapping, neutering, and releasing cats reduce their population? 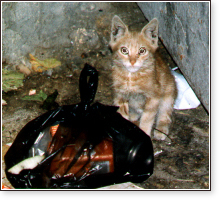 All responsible humane organizations agree that cats do not belong on the street, and the goal of any trap/neuter/vaccinate/release (TNR) program must be to eventually eliminate cats from the streets through attrition. In situations where there are natural boundaries and few new cats will enter an area, altering and releasing 70% or more of the cats in an area has been shown to reduce the population. Altering only a small percent of the cats in an area will have no effect on the overpopulation, as those unaltered will breed to meet the amount of available food. The only study of altered and released feral cats in Israel, performed by a student at Tel Aviv University's Center for Human-Animal Studies, examined three Tel Aviv feeding sites where cats were altered and released. The study found that in an "open system" where there are no borders to prevent cats from roaming, such as prevails in Israel, spaying, neutering, and feeding not only did not lower the population of cats in the three areas studied, it actually increased it. Food put out for the altered cats attracted new cats into the area. The study also found that claims that altered cats form a barrier, keeping out new cats, were false. More aggressive, unneutered cats chased away less aggressive, neutered ones, who were then without a territory or food source. 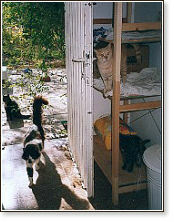 This study concluded that trap/neuter/release will not reduce the overpopulation under conditions prevalent in Israel, where the number of cats is enormous, where there are no boundaries keeping cats from drifting from one area to another, and where, according to this study, the ability to alter 70% at any one time is not possible. Despite the study's findings, its author nevertheless recommended altering and releasing cats where there are feeding stations and where there are people willing to undertake a labor-intensive process of constant, vigilant monitoring of the cats, including immediate trapping and altering of all new cats as they enter each area. In locations where feeders take responsibility for altering cats new to the area, there still remains the problem of aggressive males. Even neutered, some male cats are extremely aggressive and will attack and drive off other cats in an area. Some kibbutzim in Israel have chosen to euthanize the most aggressive males, in order to make life manageable for the other cats. All humane organizations agree that tame cats (those who can be handled and who can relate to humans) should never be put on the streets. Inhumane methods of controlling cat overpopulation, such as traps that injure or poisons that cause suffering, including alpha chlorolose and strychnine, should never be used. What is Hakol Chai doing to help? In addition to altering feral cats — those who live in managed colonies that meet our high standards of care — our mobile spay/neuter clinic is educating for change. Our clinic staff provides written information and guidance about cats' needs to responsible caregivers wherever it goes. We also offer classes in community centers and schools. Resistance on the part of the Israeli public toward neutering male cats is part of the overpopulation problem, the same resistance that was prevalent in the U.S. decades ago. We educate people to understand that altering males is beneficial for their health, besides reducing the overpopulation that causes so much suffering.